The Irish Aviation Authority has temporarily suspended the operation of all variants of the Boeing 737 MAX aircraft into and out of Irish airspace. It said it had taken the decision in the light of the two fatal accidents involving the aircraft in recent months. "This decision has been taken based on ensuring the continued safety of passengers and flight crew, which is the IAA's number one priority". The IAA added that it was closely monitoring the situation. "However, as we do not currently have sufficient information from the flight data recorder we have, as a precautionary measure, issued instructions to stop any flights on Boeing 737 MAX from any operator arriving, departing or overflying Irish airspace," it stated. The Commission for Aviation Regulation has advised those who may be affected by flights cancellations or delays as a result of the IAA's decision to be aware of their entitlements. However, the CAR said that as the disruption is a direct result of an airworthiness directive issued by the IAA, and is due to an extraordinary circumstance, compensation may not be payable. 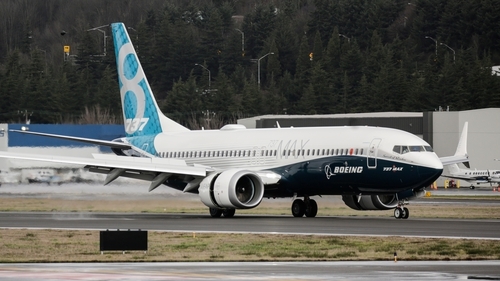 The European Union's aviation safety agency EASA has announced the suspension of all flights in the EU by Boeing's 737 MAX aircraft. In a statement, EASA said it was also "suspending all commercial flights performed by third-country operators into, within or out of the EU" of the Boeing 737-8 and 737-9 models. The moves by Irish and European regulators follow the weekend crash involving an Ethiopian Airlines passenger jet, which killed all 157 people on board. Passengers from 35 nations were on Sunday's fatal flight including 39-year-old Micheál Ryan, a married father-of-two from Co Clare, who worked with the United Nation’s World Food Programme. China, Singapore, Australia, Malaysia, Oman and India are among a host of other countries to suspend the aircraft. Turkish Airlines has halted flights of its 12 Boeing 737 MAX aircraft. Norwegian Air also confirmed today that it will ground all 18 of its MAX passenger jets. The airline said it has more than 110 Boeing 737-800 aircraft in its fleet, which are not affected by the temporary suspension. Yesterday, the United States stressed it was safe to fly the planes. Boeing has said it has "full confidence" in the safety of the 737 MAX fleet despite the two fatal crashes in Ethiopia and Indonesia since October and a rising number of regulators and airplanes grounding the planes around the world. "We understand that regulatory agencies and customers have made decisions that they believe are most appropriate for their home markets," the company said. Boeing added that the US Federal Aviation Administration "is not mandating any further action at this time, and based on the information currently available, we do not have any basis to issue new guidance to operators". The company delivered 95 aircraft in the first two months of 2019, up from 93 planes a year earlier, with its best-selling 737 MAX jets comprising nearly half of those deliveries. The world's biggest planemaker won 48 net orders between January and February, beating European rival Airbus, which did not report any wins and had 99 cancellations dominated by its widebody A350-900 aircraft and the superjumbo A380. A Boeing 737 MAX plane was involved in a Lion Air crash off Indonesia that killed 189 people in October. Investigators in Ethiopia found two black box recorders that will provide information about what happened before the plane plunged into farmland minutes after takeoff from Addis Ababa.